tissue by means of a therapeutic dressing. A healthy tooth has a space inside it called the “pulp space” which is filled with soft tissues – nerves, blood vessels, and pink connective tissue. When the carious process develops in a tooth, the bacteria associated can cause pulpal inflammation, which is often what causes toothache. Damage to the pulp of permanent teeth usually requires a Root Canal Treatment or Endodontic Therapy. The pulp of primary or deciduous teeth, which only have to survive until an adult teeth come in, and because they have a better blood supply, can sometimes be saved. 2. Keep the baby tooth in its place in order to to keep the space for the successor Permanent tooth. In some cases, in Adult teeth, the pulp within the root (the radicular pulp ) may remain healthy despite carious exposure of the pulp chamber. In cases where root formation is incomplete (as during adolescent years), a partial pulpotomy may keep the radicular pulp vital long enough to allow the roots to develop fully. A partial pulpotomy for traumatic exposures is also called a Cvek Pulpotomy. When a baby tooth or young permanent tooth is traumatised – say, hitting your teeth on the handlebars of a bike – it can be broken in such a way that the pulp is exposed. Again, a partial pulpotomy may help it to finish developing and be saved. Adult pulpotomies are not as popular with dentists today as they were 100 years ago. 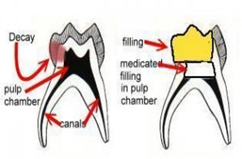 Historically, traditional endodontia has been reported to be a more reliable treatment than pulpotomy techniques, based on the rate of saved teeth and the longevity of their preservation. However, new research is changing this view. The pulpotomy, as a therapeutic dental treatment, has a long history. It has been used for thousands of years. This technique overcomes histological effects of electro-surgery. It creates a superficial zone of coagulation or necrosis that remains compatible with the underlying tissue and isolates the pulp from vigorous effects of the sub-base. With couple of second using the diode laser we can obtain the blood coagulation, great disinfection of the remaining pulp and save and durable pulpotomy, beside that is is a painless procedure.